Here we have a controversial beer, perhaps the most controversial yet on PintLog. Lambic-heads (such as yours truly) are a pretty fickle bunch, and God help anyone foolish enough to use the much vaunted Lambic title on something that doesn't truly deserve it. Unfortunately for Boston Brewing Company, that's just what they did with their Cranberry Lambic. Beer geeks have been crying foul ever since. Now, I won't get into all the geeky details (check this article for said geeky details), but suffice it to say that this beer is simply not a Lambic. I usually just go ahead and list a beer with the style the brewer had in mind, but here I just can't bring myself to do it, so we're going with the catch-all Fruit Beer style instead. All that said, PintLog gives every beer a fair shot, so we'll review this with a neutral disposition, ignoring anything to do with style. It's all rather moot anyway, as Cranberry Lambic is no longer available. It used to star prominently in the Sam Adams winter mixed pack, but was replaced in 2010 by Chocolate Bock. That ended quite a long run, as it was actually first brewed way back in 1990, back when you could get away with fudging styles a little more. As with most of the special Sam Adams brews, Jim and the boys in Boston were not afraid of a deep ingredient bill. The backbone was built of Two-Row Harrington, Metcalfe, and Copeland Pale malts, along with a helping of wheat. As for hops, Hallertau Mittelfrueh Noble hops did the deed. The yeast, perhaps the single most important component of a Lambic and the crux of the argument against this beer, used was W-68 Weissbier ale yeast. Special ingredients included New England cranberries and maple syrup. Tart and sweet, with complex fruit, maple, and vanilla notes. [...] The flavor [is] rich in fruitiness and reminiscent of cranberries, bananas, cloves, and nutmeg. The yeast fermentation also creates a slight sourness on the sides of the palate, reminiscent of the original lambic style. That sourness, along with the astringency of the cranberries, is combined with a subtle cereal note from the malted wheat. It reminds its drinker that, as fruity a beer as this is, it’s still a beer. Appearance: A deep and hazy reddish-brown body capped by a finger of rose-tinged, creamy head that features good retention and lacing. Aroma: Sweet, musty, and sour with lots of cranberry and raspberry juice. Taste: Sweet fruit juice up from with some nice acidic and sour flavors that turn things tart in the finish. Those juicy fruit flavors certainly have some cranberry notes, but are just as much, if not more, berry-like. Underneath, a wheat-like malt backbone keeps everything grounded. The aftertaste is juicy and grainy, but just a little too brief. Mouthfeel: A slightly fuller than medium and slightly syrupy body with mild carbonation. It finishes crisp and a little dry. Drinkability: A little slower than average, mostly due to the mouthfeel. 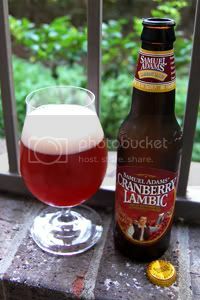 Verdict: Sam Adams' Cranberry Lambic may not be a real Lambic, but it's still an enjoyable beer - just think of it as a wheat beer with a fruit twist. It's interesting enough and really worked well as part of the Winter mixed pack (once you got past the label). Note: While this review is being published in 2011, the tasting notes contained within were taken when the beer was fresh in 2009. Actually, after being told by a company rep that it would not be available this season, I found three six packs and am enjoying them thoroughly. I'm disappointed this beer isn't in the sampler anymore. I'm a new fan of lambics. Just tried a few of the Lindeman's ones. Loved them.